Checkout the website of Todo-Backend to learn more about the idea behind this project. In short it defines a simple JSON API to maintain a list of todos and a lot of example implementations in all kinds of languages and server frameworks. We ship a mod_swift based implementation called mods_todomvc. You can toggle the state, create news ones, delete them, change the name, reorder them. The JSON endpoint required to drive this is pretty simple. A bit of JSON rendering and parsing, some GET, POST, PATCH and DELETE operations. The implementation can be found in TodoMVCMain.swift and is pretty straight forward ‘Express Code’. 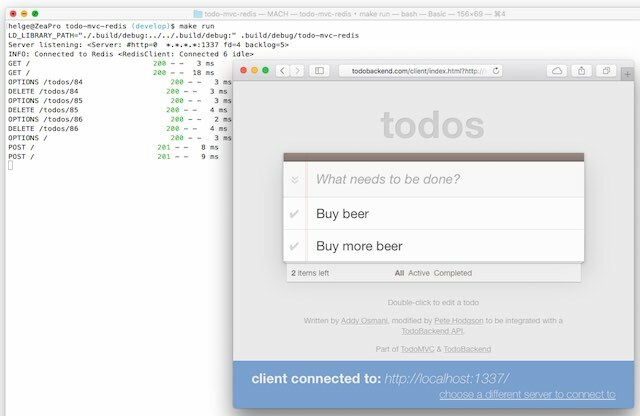 Todo-Backend is a nice thing, but we thought we take it a little further. Instead of just implementing the trivial JSON-REST API, we also added support for CalDAV. CalDAV is the IETF standard (RFC 4791) for managing calendars and todo lists. Everything the TodoMVC web client / API can do is supported. That is, you can create/delete todos, you can set the todo title, you can mark them as done/undone, and you can reorder the list of todos. 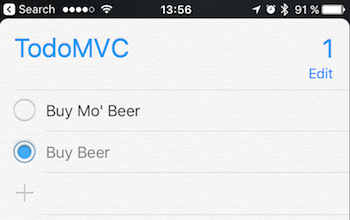 You can’t do other VTODO things, like setting priorities, attaching links, etc. After all this is still hooked up to the very simple TodoMVC model. There is only a single account. All people using your server would share the same todos. Isn’t that great? To configure go this route: iOS settings / Calendar / Accounts / Add Account / Other / Add CalDAV Account. Enter any user/password/description and put http://yourmac.local:8042/ into the Server field. On macOS: System Preferences / Internet Accounts / Add Other Account… / CalDAV account / Popup ‘Advanced’. Enter any user/password, Server Address is http://yourmac.local:8042/, Server Path is /todomvc/, put 8042 into port and deselect ‘Use SSL’. It is a little more code than the JSON protocol, but reasonable, especially considering the gains w/ supporting an actual standard. A lot of the code in there is generic and could be moved into a proper framework. Please do the right thing and use proper standards. It is not that hard! Also included is a small wrapper for the XML parser that is part of Apache. Like it? You are welcome! There is a Slack team and a Mailing list you can join for discussion.